From the 1772 to 1812, Russia fought a series of wars in the Balkans against the Ottoman Empire. These wars were the predecessor for the many future conflicts over the next century between the two Empires. The most dramatic of these campaigns was the the campaign of 1810 byGeneral Kamenskoi in Bulgaria. This paper examines the campaign of 1810 and how it set the stage for Russian embroilment in the region. 1772-1773: Generals Rumyantsev and Suvorov cross the Danube into Bulgaria; Suvorov beats the Turks at Koseldui, Rumyantsev is defeated outside Schumen. 1789-1792: Generals Repnin and Suvorov invade Moldavia (Romania), and take Ismail, on the Danube, by storm. 1806: Russian armies under Michelson invade Moldavia and Wallachia cross the Danube and defeat Turks at Bazardjik. 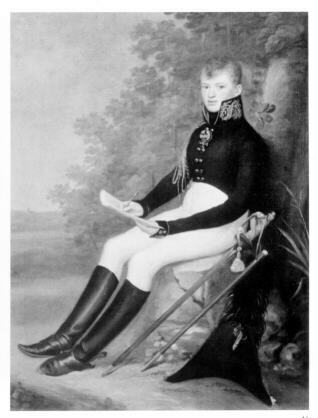 1809: Prince Prosorovski attacks Turks on the Danube. Russians unsuccessful at Braila, but capture Ismail and Constanta. Bagration briefly assumes command in October 1809. Early in 1810 Count Nikolai Kamenskoi assumed command of Russia's Army of the Danube, then garrisoned around Bucharest in present day Romania, and set in train preparations for the Russian bid to replace the Ottoman Turks as the dominating power in the Balkan Peninsula. With a force numbering around 100,000 men, Kamenskoi felt that he was in a position not only to militarily defeat the Turks but, perhaps, also to push onto Constantinople and end, in Russia's favour, the series of stalemates and indecisive campaigns which had characterised Russia's previous conflicts with the Ottomans. Faced by a numerous and determined enemy, the Russian commander was embarking on a campaign knowing full well that Balkan history has in it the making and breaking not just of reputations but also of empires. It was to be, according to one contemporary, a war which would was to cost 'much money and more lives'. Count Kamenskoi was a gifted commander - and son of a famous Russian general - and succeeded Bagration in command of Russia's troops in the Balkans. He was a strong character 'clever, generous, and free with praise' as a subordinate wrote. He also took considerable pains to look after the welfare of his troops and was rated an excellent administrator. A German officer in Russian service felt that Kamenskoi was at least the equal of Bagration in the field, but far superior to him in administration and in organising supplies and munitions. Kamenskoi's appointment gave the Russian armies new impetus and the same German officer, Schubert, noted that the troops making up the army were good but that the laxity of the previous commander (Bagration) had bred insubordination. In May 1810, the Russian army began its march from winter quarters towards the Danube, accompanied by a mass of wagons, horses, oxen, mules, and camels. The Russian bid to decisively defeat the Ottomans had begun. Crossing the Danube, the jubilant Russians advanced on the main Ottoman field force of 25,000 men, commanded by Mustapha Bairaktar, at Bazardjik. On 3 June, the Russians attacked the fortified camp and routed the Ottoman troops. Colonel Woronzow of the Narvski Infantry Regiment so distinguished himself at this battle that he was promoted to Major General on the field of battle. It was a decisive victory and a promising opening to the campaign. Kamenskoi, who had directed a force under the French émigré Langeron and Count Platov to secure Silistra on the Danube, prepared to strike south towards Schumen, the Turkish base in eastern Bulgaria and the key defensive position on the road to Constantinople. Langeron blockaded Silistra, aided by a small Russian flotilla on the Danube, and began siege operations against this strongpoint (it was a formidably defended town and had easily withstood a Russian siege in October 1809). On the night of 6 June, the Russian batteries began to bombard the town. By a stroke of luck, a mortar shell fell into the citadel, burst and ignited a Turkish powder magazine, triggering a massive explosion. The resulting firework display resembled a volcanic erruption. On the next day the Turks, their position untenable, sought capitulation and the garrison marched out. Kamenskoi's advance on Schumen was proving more problematic. He detatched a force under General Löwis to seize Razgrad, then secure his wing and await orders to join him before Schumen. The Russian advance was plagued by Turkish cavalry, fighting superbly and such a danger that the Russians had to form wagon circles when they camped at night. The Russian cavalry, with the exception of cossacks, were far out-classed. The Russians arrived before Schumen and immediately came under attack from a large force of cavalry supported by infantry. The Russians formed squares were 'like so many rocks in an ocean of cavalry' with regimental artillery positioned at each corner and wagons and cavalry in the centre. The Turkish cavalry were reported as being so enraged by the failure of their charges that they dismounted before the squares and attempted to fight hand to hand with the Russian infantry. No squares were broken but the action had become something of a stalemate. Kamenskoi eagerly awaited Löwis, who had taken Razgrad some days previously and was now supposed to be approaching with 7,000 men. Unfortunately, Löwis, who had received the orders, took the wrong road and sent just two battalions of the 14th Jägers, under Prince Troubetzkoy, in the right direction. These were insufficient to make a difference, and Kamenskoi experienced his first setback. So, leaving a covering force of some 30,000 under the command of his brother Sergei Kamenskoi, Kamenskoi turned northwards towards the key Danubian port of Rustchuk. Seizing this vital town would guarantee an excellent base for any further campaigning and would also shorten Russian communications to Bucharest and bring closer the much needed reserves and supplies in Moldavia. Sergei Kamenskoi would prove adept at this task, preventing Turkish attempts to take his brother's troops in the rear. One such action occured in mid-July when the Turks sortied out of Schumen and attacked Russian troops at the village of Derekioi. Thanks to Sergei Kamenskoi's prompt action, 12,000 Turks were defeated and driven back into Schumen with the loss of 600 men. In June General Sass had arrived outside Rustchuk from Silistra. He merely blockaded the town from the land, having insufficient troops to deal with the substantial garrison, and took stock of the fortifications - the town's walls were tall, replete with bastions and protected by a deep and wide ditch. The town itself, with a population of 5,000 Turks, was a maze of narrow streets surrounding a strong citadel. Within the walls the Turks could count on a garrison of 20,000 men supported and supplied by the inhabitants. The Turkish commander also relied on relief from Turkish forces then gathering in western Bulgaria under the Governor of Sofia, Kuchanz Ali, and felt that his troops were well prepared to withstand a siege. Sass made his base by the Silistra road, between the Danube and the hills to the south of Rustchuk, and sent troops to sever the town's links to another Turkish base at Nikopol in the west. He even began some elementary siege works, digging trenches and establishing defensive works along the Danube. Kamenskoi arrived outside the strong and well equipped fortress to support Sass in early July 1810. The officer commanding the Russian artillery, the Dutch general Hartingh, and that commanding the infantry, General Count Sievers, now set about reducing the fortress. However, an initial bombardment was ineffective and the mundane task of siege work continued in the blazing heat of a Balkan summer. The casualties were indeed appalling. The Oukrainski Infantry Regiment, which had formed most of the first assault, lost 600 killled. The Apscheronski Regiment lost 27 officers and 700 men killed and was reduced to 300 effectives. This cadre was so demoralised that they had to be sent to Jassy in Moldavia to refit and recover. Kamenskoi, although stunned, had men ferried over from Moldavia and brought up Langeron's division from Sergei Kamenskoi's covering force near Schumen in an attempt to make good his losses. For he was now in dire need of troops. The Turks had gathered sufficient troops in western Bulgaria, pulling Janissaries, Arnauts (Macedonian and Greek mercenaries) and Sekhans (provincial militias of volunteers) down from Serbia, and directing them eastwards to relieve Rustchuk. The relief force of 30,000 men, commanded by the Seraskier of Sofia, left Sofia in early August and marched in a northeasterly direction aiming, with the assistance of the Grand Vizir in Schumen, to drive a wedge between Kamenskoi and his brother and defeat both in detail. In early August the Turks had crossed the river Yantra, a tributary of the Danube, and clashed with troops commanded by General Ouvarov around Batin. Ouvarov, charged by Kamenskoi to delay the Turks, fell back but was surprised to find the Turks, instead of advancing, halting and digging in. Kamenskoi, before Rustchuk, sent an urgent appeal to his brother and called upon him to provide 10,000 men from the troops stationed before Schumen. Sergei Kamenskoi, commanding Ilovaiski's, Kulnev's, Sabaniev's and St Priest's brigades, came in person and joined forces with Ouvarov before the Turkish position. Kamenskoi, leaving a small covering force under General Langeron before Rustchuk, and leading Bulatov's division, advanced rapidly in support and prepared to assault the five fortified camps the Turks had prepared around Batin. Early on the morning of 9 September 1810, before most of Bulatov's troops had come up, the Russians put their plan into operation. Sergei Kamenskoi, given command of the Russian right, advanced with Ouvarov's and Ilovaiski's troops and made a demonstration against the heavily defended Turkish left with the assistance of Russian gunboats on the Danube. He also worked cavalry around the edge of the Turkish position to take up a position behind the main Turkish line. The gunboats caught a small Turkish flotilla, anchored close to the Turkish position on the Danube, by surprise and sank two and captured five of the vessels. At the same time, in the centre and on the left, Kamenskoi pushed Kulnev's troops forwards in a covering screen and deployed Sabaniev's and St Priest's troops into column. Kulnev moved to one side to allow the columns to advance but they, due to the vast numbers of Turkish cavalry, had to form square to continue. Emerging from the shallow ravine before ascending the slope towards the Turkish camps, the Russian infantry were swept by artillery fire which, due to the infantry's formation, caused excessive casualties and spread momentary confusion in their ranks. The colonel of the Kozlovski Infantry Regiment was wounded twice in as many minutes. Kamenskoi, seeing the progress of the assault stall, sent Kulnev's cavalry round the Turkish right flank with orders to take the Turks in the rear. Covered by a haze of cossacks, Kulnev moved towards the Russian left, deployed his two regular regiments and gallantly charged, putting to flight a body of Albanian cavalry stationed near the village of Batin. Kamenskoi's infantry, profitting from this confusion, now resumed its advance, supported by Russian troops coming from the right, formed up into columns and stormed the Turkish fortifications in the centre of their line with the bayonet. Artillery, covered by cavalry, was then manhandled forward and opened a galling fire on the Turkish defences from very close range. At the same time Sergei Kamenskoi pressed home his assault and broke the Turkish left wing. The great majority of the Turks then fled. The morale of the Turkish force was now destroyed and its leader, its camp and artillery was taken. Only Muchtar Pasha, son of the Pasha of Jannina [known as Ali Pasha], escaped, breaking out with around 4,000 Albanian cavalry and escaping towards Turnovo. Only a handful continued to resist, 200 surrendering with the Turkish commander in the last of the fortified camps to hold out. The Russian cavalry pursued the fugitives for 15kms. The battle had cost the Russians 1,542 dead and wounded and the Turks some 5,000 dead and wounded and 5,086 prisoners. The Russians also took 14 guns and 178 flags. A group of Russian officers were amazed to find that some of the muskets captured from the Turks had been made at the Russian arms factory of Tula and had been supplied by the Russian government to Epirus in Albania in 1804. The battle, an astonishing assault by 21,000 Russians on 40,000 Turkish troops protected by fieldworks and holding a naturally strong defensive position, effectively sealed the fate of Rustchuk. With the Turkish relief force scattered and the Grand Vizir, the 75 year old Yusuf Zia Pasha, sat inactive at Schumen, penned in by a small covering force, Kamenskoi was free to return to Rustchuk and continue the siege at his leisure. The Turks had been shaken by the defeat of the only available relief force and the siege progressed methodically as the Russians severed all links between Rustchuk and the Turkish garrison at Giurgevo on the opposite side of the Danube. General Sass, supported by the Russian flotilla of gunboats, which had sailed up the Danube, managed to silence the Turkish defences. From then on it was only a question of time as to how long the Turks could hold out, the comparatively undefended city now being exposed to constant fire from Russian guns. On 26 September the Turks surrendered and the remaining 15,000 men of the garrison were marched out and set free without their weapons. Rustchuk itself had suffered severely from the Russian artillery and constant fighting. Little evidence has survived as to how the town now appeared although Sir Robert Wilson noted in a letter to Britain's ambassador at Constantinople, dated 2 August 1812 (two years after the bitterest fighting), that he had reached the 'ruins of Rustchuk'. The situation early in 1811 seemed to favour the Russians. The Ottomans, despairing at the Grand Vizir's inactivity, had him replaced by a younger man - Laz Achmet Aga - and Kamenskoi believed it was a suitable time to launch an offensive before the new commander adjusted to his position. With bases on the Danube secure and new strategic possibilities opened up by the fall of Rustchuk, Kamenskoi directed an attack aimed at seizing Sliven, an important fort on the road to Constantinople. To do this he had to secure Lovech and he took this place by storm on 11 February. However, Kamenskoi succumbed to a fever and was forced to resign his command and return to Russia in the Spring of 1811. He died in Odessa on 4 May 1811. Kamenskoi was replaced by Kutuzov. Yet just as he assumed command, Russia's military interests were switched towards facing the menacing clouds now gathering in northern Europe. The Czar's relationship with Napoleon, always difficult but now shaken and belligerent, meant that Russia's troops were needed elsewhere and the Army of the Danube found itself reduced by five divisions. Even so, Kutuzov managed to defeat the Turks in 1811, bring about a general peace (signed at Bucharest in May 1812) and an end this particular Balkan war. The war had indeed cost much money and many men and had sown the seeds of Russo-Turkish conflict for the remainder of the century. But this war was also a key element in the Napoleonic Wars and one unaccountably neglected. The siege of Rustchuk in 1810 was one of the most dramatic episodes of those long and catastrophic campaigns. Its fall was a tremendous victory for the Russians and one which they were only unable to exploit due to events far removed from the Balkans. Had the Balkans remained the object of Russian intent in 1811 and 1812, the course of European history may well have been very different and any Eastern question an entirely different issue. Yet it was not to be. Bulgaria remained Turkish, the decisive gain of Rustchuk was only partially exploited, the Russians gave up their Balkan conquests in the May of 1812 in order to concentrate on meeting the threat of Napoleonic invasion of Russia. The Army of the Danube was soon to find itself marching and next saw action in radically different circumstances and in dramatically different conditions - clashing with Napoleon's troops along the frosty banks of the Beresina in November 1812. Thanks to the staff of the Kliment Ochridski University, Sofia, and the Military Museum, Sofia. Langeron, L. Memoires de Langeron, General dans l'armees russe Paris;1902. Mikhailovski-Danilevskii, A. I. Opisanie Turetskoi Voine v'Tsarstvovanie Imperatora Aleksandra St. Petersburg; 1843. Parkinson, R. The Fox of the North: The Life of Kutuzov Oxford : Oxford University Press; 1976. Schubert, Frederich von. Unter dem Doppeladler Stuttgart; 1962. Wilson, Sir Robert. Narrative of Events during the Invasion of Russia London; 1860.